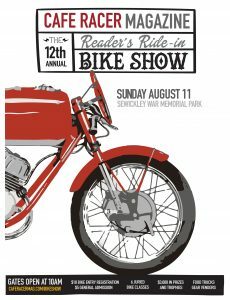 Spring is finally here, but we’re busy planning Cafe Racer’s biggest event of the summer- our 12th Annual Reader’s Ride-In Custom Show. Get those handbuilt speedbikes ready as the event happens at Sewickley’s War memorial park on Sunday, August 11. The response to the show both from you, our stalwart readers and the motorcycle industry has been overwhelmingly positive with more attendees and bikes rolling in year after year. In an age when custom motorcycle show generally means exclusive, invite-only events staged indoors where you never know if the bike son display are even capable of turning a wheel, this event remains focused on the performance capabilities of classic and custom cafe racers. As an added plus, many of the brilliantly winding roads surrounding War memorial park have received re-paving over the recent months, making for some of the most exciting rides in the region. We’ll be displaying maps and tips on which local roads t choose as well as details on Sewickley-area attraction for you to visit during the weekend. Stay tuned to this page for updates on prizes, sponsors and other fun stuff to expect as August 11 rolls around.